The Sugar Plum Market is almost here! Presented by the Fort Bend Junior Service League (FBJSL) and Memorial Hermann, the theme for the 17th Annual Market is “Believe in The Magic.” Shoppers will be treated to spectacular holiday décor, wonderful vendors, and a fantastic weekend of shopping on Friday, November 3rd and Saturday, November 4th at the Stafford Centre Performing Arts Theatre and Convention Center. Proceeds from the Market will benefit local Fort Bend County charities. Through generous patrons and sponsors, the Sugar Plum Market was able to donate needed funds to 22 different charities last year. This Year the Market is excited to sprinkle even more of this magic on this beloved county! A portion of the proceeds from the 2017 Sugar Plum Market will directly benefit Fort Bend County charities, many which have been impacted by the devastation of Hurricane Harvey, through the Fort Bend Junior Service League Community Assistance Fund. It’s not too late for you to join in spreading magic to our beloved non-profits especially those impacted by Hurricane Harvey. For as little as $250, individuals or businesses can become a sponsor and receive benefits including event signage, website recognition, Preview Night tickets and an invitation to the check presentation party. In addition to the 2017 Sugar Plum Market’s title sponsor, Memorial Hermann, top sponsors to date include City of Stafford, Pamela Printing, Fort Bend Lifestyles & Homes, absolutely! focus media, Sterling McCall Nissan, 26 Daisies Catering and Events, Kendra Scott, Randalls, and HEB. The Market will begin with a Preview Night from 6-10 p.m. on Thursday, November 2nd. Preview Night patrons will take part in an exclusive evening of shopping while enjoying yummy bites provided by 26 Daisies Catering and Events. The VIP Preview Night ticket also entitles shoppers to a drink ticket and admission to the Market on Friday and Saturday. The Sugar Plum Market will open its doors on Friday from 9 a.m. to 8 p.m. and Saturday from 9 a.m. to 5 p.m. With over 100 vendors and a large raffle showcase, it will truly be a one-stop holiday shopping experience. A limited quantity of Preview Night tickets, $75 each, and General Admission tickets, $12 each, are available now at www.sugarplummarket.com. General Admission tickets may be purchased at select Randalls stores beginning October 5th and also at the door during Market hours. For more information on sponsorship opportunities, participating vendors, or to purchase tickets, please visit www.sugarplummarket.com or call 281-636-6272. 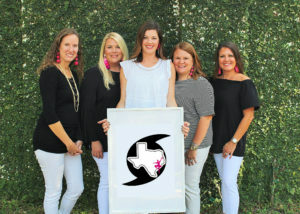 Photo: (Left to Right) Sugar Plum Market 2017 Co-Chairs: Sarah Kuehl, Kimberly Camp, Katie Harris, Monica Henderson, and Heather Brown. Not pictured: Melissa Blackford.